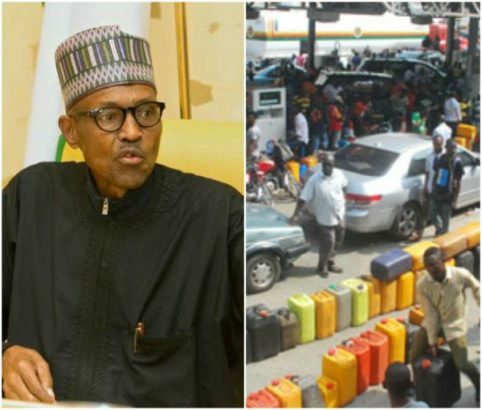 #FUELSCARCITY: Thank You President Buhari, We All Got Served – Royal Times of Nigeria. Let me say an immense Thank you to President Muhammadu Buhari and his able team for this Christmas gift. I hope other Nigerians are also indebted enough to join in lauding the All Progressive Congress ruling government. It’s been an amazing year topsy-turvy and I guess the end gift is something that will remain etched in the memory of millions for a long time. It is unquantifiable and calls for no jostling; everyone got a fair share. If you don’t go through the rigour of sleepless hours and endless queue at filling stations, you spend longer time waiting for commercial cabs and pay heavy fare – that is if you even get. If you avoid the long queues, you will spend your high earned money buying adulterated product at costly price by the road side, one that may even take a toll on your car engine and shorten its lifespan. If you escape all of these, you feel the ripple effect via the price you pay for goods and services which has skyrocketed as a result of the uncontrolled price of PMS. Hope you now agree that we’ve all had a share. In fact, it’s a buffet. You serve yourself. Around December, it is becoming habitual that we need to congratulate one another for three things; Merry Christmas, Happy New Year and the Nigerian-made Happy Fuel Scarcity. The failures of the Muhammadu Buhari-led administration has today made many conclude that he sold us a dummy with the campaign pledge to change the fortune of Nigerians, not just in the oil sector but in many other sectors. The anti-corruption crusade on the crest of which the present administration rode into power is getting messier by the day. From accusations of high-handedness to selective anti-graft fight. From the reports of budget bloating, padding and poor implementation to the embarrassment of the ‘Grass-cutting’ and ‘Mainagate scandal’ which has been characterized by claims, counter-claims, denials, endless probes and public hearing all to no avail. Our Governors have displayed high senses of lawlessness, financial recklessness, insensitivity, nepotism and lack of foresight. Greetings to Governor Rochas Okorocha. Nigerians were only expressing concern over the approval of $1bn Excess Crude fund for the fight against terrorism when the December guest – fuel scarcity – crept in like a thief in the night. It has become highly worrisome because the pain is being inflicted on a people who sacrificed their edgy comfort to embrace the removal of subsidy and sign that accord to part with N145 for a litre of PMS. The APC is trampling on the goodwill that the immediate past government of Goodluck Jonathan never had the luxury to enjoy. GEJ will forever remember the nationwide protest that greeted his attempt to raise the price of petrol to N141 per litre, one that was also spearheaded by leaders of the ruling APC, then the opposition party. Perhaps, I am too young to say, but the backing and resilience Nigerians have gifted the Buhari administration is second to none in the history of this nation. Even as we speak, prices of goods and services have refused to go back to normal after the austere 2017 economic recession that made some families trade their children in exchange for food in the market. Amazingly, the President, who assured of an improved health service and advocates local content, went on an indefinite medical tourism abroad for months. Needless to say that a huge fraction of the Nigerian population still welcomed him back to the country amid pomp and pageantry. It was astonishing except for a few isolated groups calling for his comeback. Of course, we all know how popular the team led by Charlie Boy was. Except the ruling party is still leaving in a world of illusion, the ripostes to President Buhari’s first comment on the fuel imbroglio is enough to reveal that Nigerians are getting pushed to the wall. For anyone who takes just a cursory perusal of the tweets, it’s effortless to infer that these are PMB’s loyalists losing hope gradually. Many expressed disappointment that it took him so long – as it has become habitual – to react to his government’s flunks, others reminded him it is now becoming numerous and unforgivable. One of the burning issues was the sentence, “I am being regularly briefed” in that statement. Who could have thought the Minister of Petroleum Resources, who should know better and be on top of the situation is just in the grandeur of the Presidential Villa awaiting briefs that will likely never reflect the reality. That has not taken President Buhari’s ‘unblemished’ integrity from him though. It just doesn’t suffice because a modern day Nigeria requires exceptional leadership acumen to steer her ship. The people’s reaction online is a parameter for raw measurement of popularity and without mincing words, it shows that the confidence that PMB and the APC fought tirelessly to build is slowly but surely waning. It is not excusable to say the present situation is sudden. That will be catastrophic for any party that knows its onions. The APC is about falling into that pit, attributing the present fuel situation to an act of sabotage. If a government cannot check sabotage, it is heading for doom. But funny enough, the party leaders seem so befuddled not to realize they are towing the same path the Peoples Democratic Party, PDP towed. Although, a perfect tale of the kettle calling the pot black, the opposition party is bidding to pay the ruling party back in its own coin, seemingly doing a copy and paste of the Lai Mohammed press statements that flooded every editors’ desk prior to the 2015 poll. Their act of empathy should obviously be viewed as Greek bearing gifts, although, electorates could choose to opt for a devil they know well. With 2019 fast approaching, the elections are for the ruling APC to lose, but their complacency may leave a bitter taste in their mouth if electorates decides to slap them with their votes at the polls. Merry Christmas in arrears, Happy New Year in advance and an unending fuel scarcity. You can follow Taiwo Adediran on twitter, @adedirantai.